I’ve only done a liveblog once before, during this year’s Oscar ceremony, but if there’s one event that can rival the excitement of Hollywood’s big night it’s the arrival of my Anuvahood Blu-ray. I missed the film during its surprisingly successful cinema run, partly because of the critical slaughtering it received and partly because I was too busy going ON AND ON about Submarine. So, for barely any reason whatsoever, let’s liveblog this mother. 11:50am – There certainly are a fuckload of trailers on this disc. First up: The Veteran, a gritty British crime drama starring Ashley ‘Bashy’ Thomas and Toby Kebbell. That’s followed by Shank, a dystopian-future thriller also starring Ashley ‘Bashy’ Thomas. And finally a promo for Sket, ‘the ultimate urban revenge thriller coming to cinemas this autumn’ which may or may not feature Ashley ‘Bashy’ Thomas. 11:55am – Now there’s an advert for Mars bars with lots of happy ‘ordinary folk’ doing work ‘within the community’. 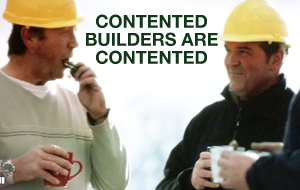 I wish I had a community, then I could be as happy as those builders. Don’t be a wasteman in your street. 12:00pm – Okay, let’s roll. 12:03pm – Jesus this film is bright. 12:04pm – It’s Paul Kaye! 12:05pm – An inexplicably cameo from Levi ‘Reggae Reggae Sauce’ Roots gives way to a pretty good title sequence introducing A CAST OF HUMOUROUS STEREOTYPE-DEFYING CHARACTERS. I think the villain of the piece is probably the guy who just threw a small child into a road. 12:11pm – Fun cameo from Ashley Walters as a crack addict called ‘Cracks’. A man on a roof is dressed as a superhero. I’m sure this is all going to make sense eventually. 12:12pm – Adam Deacon’s parents are played by Linda Robson and Perry Benson. That’s an extra star on the final score right there. Another thought: Timmy Mallett and Terrence Malick have almost the same name. 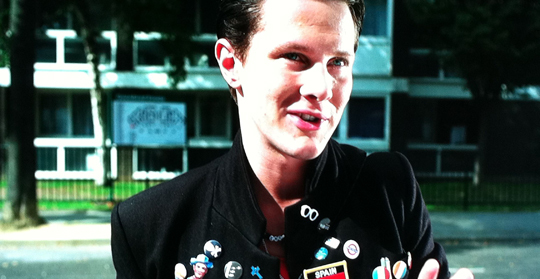 12:23pm – It’s him from Skins as a Spanish man! 12:24pm – Woop woop! The Fruitella line just got its airing. Quite funny. Probably funnier without my MASSIVELY HIGH EXPECTATIONS. 12:27pm – Just did a proper laugh. A proper one. 12:28pm – A bit of borderline homophobia there: Deacon says he’s a ladies’ man (my words) and then bumps into a massively camp gay couple who seem to be old friends of his. Most of the humour is at their expense, but it could be worse all things considered. 12:33pm – Have I mentioned that this film looks absolutely beautiful on Blu-ray? They’ve clearly made things as immensely colourful as possible to distance the film from its more grim ‘urban’ contemporaries, and it’s looking sharp here. 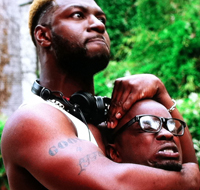 12:33pm – Here’s a photo of Tyrone the villain squeezing a man’s head. 12:39pm – Deacon just used the word ‘longage’ to great effect. And Jaime Winstone was there too but I’m not sure why. 12:40pm – Jesus! There’s even a plotline within the film about film piracy. That’s meta that is. 12:42pm – All the racial stereotyping in this film is confusing me. It’s clearly quite all good-natured (and some it could just about use the irony defence) but it’s still not the type of stuff you’d get away with in most comedies. 12:49pm – Oh dear. It’s all gone a bit serious. Linda Robson and Perry Benson have been burgled and now Kenneth’s got a gun. WHERE HAVE ALL THE INCONGRUOUS POP CULTURAL REFERENCES GONE? 12:52pm – Jazzie Zonzolo who plays TJ used to have his own show on Channel AKA. Fun fact. 12:54pm – Incredibly long drug dealing montage. You can’t argue with a lyric like ‘it’s the Murkle Man, never gonna flex like Urkel man’. 1:03pm – The one Asian man in this film really can’t catch a break. 1:05pm – They haven’t come back to the gun for a while, but now that most of his friends are abandoning him I imagine Deacon’s big Travis Bickle moment isn’t far away. 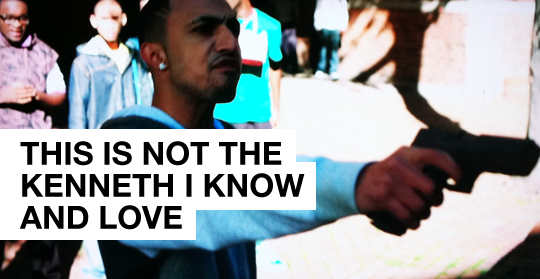 1:06pm – I’m going to start calling him by his character name, Kenneth, rather than just ‘Adam Deacon’. It’s the done thing. 1:10pm – Entirely repulsive cameo from ex-Big Brother contestant Aisleyne Horgan-Wallace. 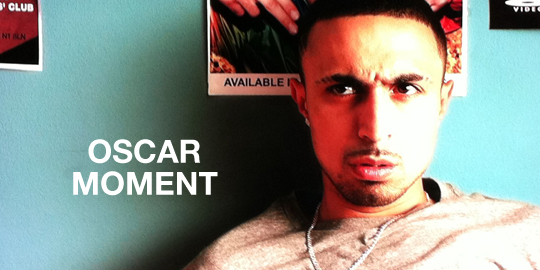 1:14pm – I almost forgot to mention Adam Deacon’s Big Serious Scene. Without saying a word his emotions (and a fuckload of flashback voiceover) told us that he’s tired of being a laughing stock and is determined to do something about it. I fear Kenneth may be about to become a whole lot less likeable. 1:17pm – I’ve paused it so that I can go and make some tea. Please be patient, normal service will resume momentarily. 1:25pm – Tea’s ready, and I was just considering popping out for something to eat when I remembered that I’d also been sent an Anuvahood goody bag! 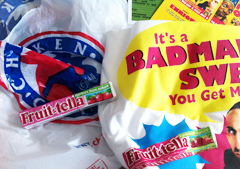 I am now wearing the promotional t-shirt, eating Fruitella and using the Chicken Cottage bag it all came in as a makeshift hat. 1:30pm – Okay, let’s carry on shall we? 1:32pm – They could use this blu as a a demo disc in electronics stores. I mean, they probably shouldn’t. But they could. 1:34pm – The Fruitellas are all strawberry! AWESOME. 1:36pm – Aisleyne just got knocked out. 1:37pm – I have absolutely no idea what is going on but at the moment I’m siding with Tyrone. 1:41pm – Tyrone and Kenneth are about to have a face-off I think. Meanwhile, I’m IMDb’ing the film’s impressive cinematographer Felix Wiedermann, whose next film happens to be… Sket. 1:49pm – Kenneth’s gone all American Psycho on me. Just look what he’s gone and done to poor old Tyrone. He never did anything to hurt anybody. 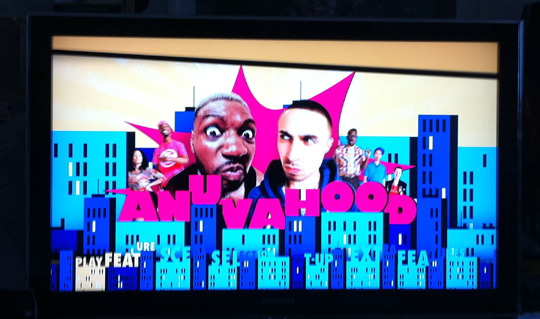 1:54pm – Isn’t Richard Blackwood supposed to be in this? Have I missed him? 2:01pm – Blackwood’s back. He’s not fantastic. 2:03pm – ‘Life is about choices, and you gotta make the right ones’. And with that vague and fairly unsubstantiated conclusion, it’s over. That was a reasonably good movie – 0.57/1.